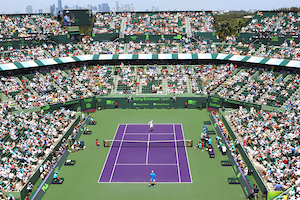 Friday hails the return to competition of the world’s best at the Miami Open. World number one and six time victor Novak Djokovic clashes with Australian Bernard Tomic in the evening session. This will be the pairs’ sixth meeting with the Serb having prevailed in all five of their prior encounters. The daytime has 2018 champion John Isner tussling with 23 year old qualifier Lorenzo Sonego to get on to the third round. Indian Wells titleholder Dominic Thiem begins his quest for back to back titles by facing Hurbert Hurkacz. Other notable names on court Friday include 2016 finalist Kei Nishikori, the entertaining Frenchman Gael Monfils and 2016 Wimbledon finalist Milos Raonic.